- Fair is ideal for light skin tones. Sun protection is the fundamental step in keeping skin healthy and beautiful. Get a soft- focus finish and the ultimate protection from sun damage and its ageing effects. Sunforgettable is easy to apply and reapply throughout the day to keep your skin protected and beautiful. Sunforgettable - is a lightweight mineral powder with a barely-there feel that provides a safe, non-irritating, instant UVA and UVB sun protection. The self-dispensing powder brush makes this sheer formula easy to apply and reapply throughout the day. 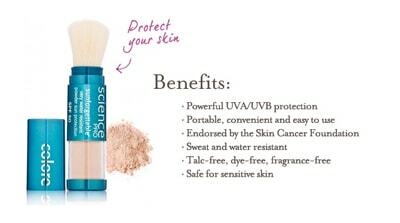 Colorescience Sunforgettable Loose Mineral Sunscreen Brush SPF 50 is an incredible clear, weightless powder that provides long-lasting SPF 50 sun protection. This brush-on mineral formula is free of dyes, chemicals, colorants and odors, making it ideal for anyone and everyone -- men, women, children, even people with rosacea or eczema. Sunforgettable has now received the FDA seal of approval and the Seal of Recommendation from the Skin Cancer Foundation of America. Fair is ideal for light skin tones. Apply generously and uniformly before sun exposure, repeat application after perspiring, immersion in water or toweling. 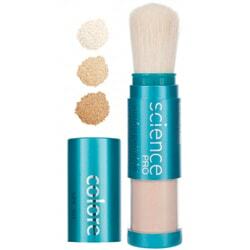 Application brush should be cleaned regularly with Colorescience Makeup Tools - Brush Cleaner Spray for optimal results and ease of product usage.